One of Australia’s best known social enterprises, The Big Issue magazine, has thrust the issue of women’s homelessness into the spotlight by calling on corporate Australia to help address the problem. 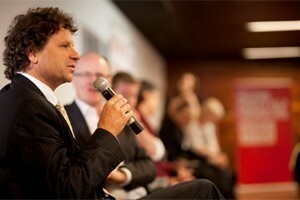 Australian of the Year Simon McKeon at the Big Issue event. 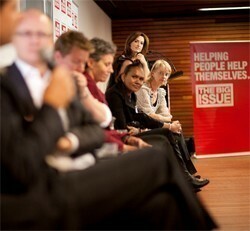 Under the banner of The Big Issue’s initiative – the Women’s Subscription Enterprise, a panel of high-profile experts from the business and community sectors joined 100 influential corporate guests at a “round table” event at NAB in Melbourne’s Docklands to discuss the issues surrounding women’s homelessness and practical ways to help. With more than 46,000 Australian women homeless every night, the social enterprise says it has become a critical issue which needs immediate attention and many leaders in corporate Australia have been shocked to hear about the magnitude of the problem. Panelists included the 2011 Australian of the Year, Simon McKeon, the Barefoot Investor, Scott Pape, NAB deputy group CEO, Michael Ullmer, anthropologist and general manager of research and service development, Hanover Welfare Services, Dr Shelley Mallet, CEO of McAuley Community Services for Women, Jocelyn Bignold, the head of the Women’s Subscription Enterprise, Natalie Pryles. The round table was told that with every 100 subscriptions sold to The Big Issue magazine, the Women’s Subscriptions Enterprise can employ one homeless woman to sort, collate and insert the magazine for distribution to subscribers every fortnight. With domestic and family violence the largest single cause of homelessness in Australia, which overwhelmingly affects women and children, The Big Issue says it has identified the need for a program addressing the specific needs of homeless women. The head of the Women’s Subscription Enterprise, Natalie Pryles says that while the Street Magazine Enterprise (where The Big Issue is sold on the street), shows remarkable outcomes for homeless and marginalised vendors, 85 per cent of those vendors are male. Pryles says selling The Big Issue on the street is unsuitable for many homeless women for a variety of reasons, including child care responsibilities and the unwelcome connotations that come with working on a street corner. She says something needed to be done that specifically targeted the issues of women’s homelessness in a safe and appropriate way. She says that with every 100 subscriptions to The Big Issue magazine, another disadvantaged woman is given the chance to earn an income in a safe, secure and rewarding environment. She says as a stepping stone, it provides participants valuable work experience and skills to help prepare for a mainstream job. 2011 Australian of the Year, prominent investment banker, philanthropist and social entrepreneur, Simon McKeon, spoke of corporate Australia’s responsibility to support social initiatives such as The Women’s Subscription Enterprise. McKeon told the round table that businesses work best on a ‘hand up’ rather than a ‘hand out’ basis, so supporting a social enterprise such as The Women’s Subscription Enterprise, which provides women with opportunities to earn an income, is a no brainer. Natalie Pryles says for many corporates the issue of homelessness is often seen as being too complex for one company to make any impact. However she says the subscription initiative is a simple and effective way towards a practical solution. She says she was hoping the guests would take up to 1000 subscriptions as a result of the ‘round table’ event. The subscriptions are $155 per year and corporates can gift the subscriptions to their community partners if they are unable to give them to staff.